I don’t have to tell you that with the advent of The Long Way Round, dual sport, or adventure (ADV) bikes have become increasingly popular (wait…I just did). 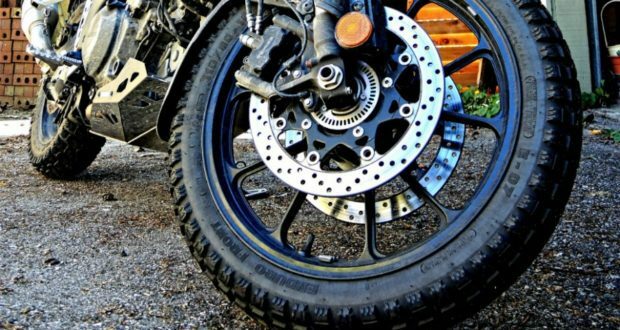 As a result, tire manufacturers have been scrambling to release new models to suit this type of do-anything motorcycle. But how do you create a tire that’s both good at hauling it on the twisties, cruising on the super slab, and doing it in the dirt? Exactly my conundrum once I purchased a 2014 Suzuki V-Strom 1000. I’d bought the bike because I wanted to be able to tour, run around town, run up and down the Sea to Sky Highway, and work my way along Forest Service Roads and trails to find those elusive yet fabulous wild camping spots that are so prevalent out here on the left coast. Is it possible to create a do-everything tire to go along with the do-everything bike? 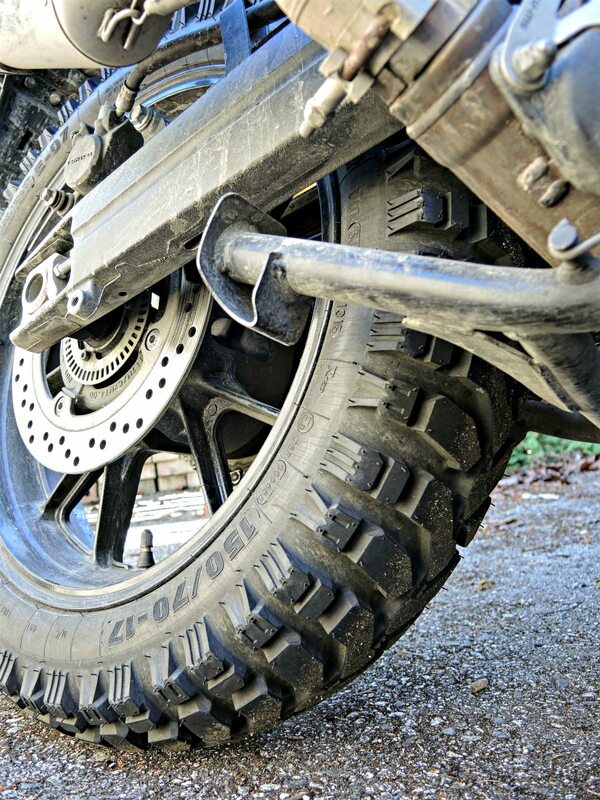 Motorcycle manufacturers know that a lot of their ADV bikes are never going off-road. I’ve even spoken to BMW reps who readily admit that a lot of their high-dollar GS’s are never going to get dirty. As such, most makers fit “80-20” tires to their big ADV bikes at the factory: a tire that’s made for 80% pavement use and 20% off-pavement. In my opinion, most of these tires are 90-10 at best. Like the Bridgestone Battlewings (what an odd name) that came on the mighty V-Strom. They were good road tires, but off-road they were scary. Now, when you’re going to start your own search for tires, be honest with yourself about what your needs are. Those big knobbies might look cool, but they’re going to make your life miserable if all you do is ride the highway, or want to carve some corners. Delving deep into the interwebs, source of all knowledge, a winner seemed to emerge: the Heidenau K60 Scout. These are rated as a 50-50 tire. Many a rider sang its praises, and after speaking with a number of riders who’d ridden them to Alaska and back, I started to think this could be my next tire. But looking deeper, I discovered two issues. First, they’re about the most expensive tire in the segment. Second, they have a solid band of rubber that runs down the centre of the tire tread that makes them less noisy and more roadworthy on the highway, but it can work against you in the messy stuff. When the roads turn to snot, or even less than not, that centre strip can cost you traction. Further investigation was required. I started seeing mention of the Mitas E-07 Dakar, also rated as a 50-50 tire. Not a brand that I was familiar with, but when I started looking for them, I found plenty of chatter about what great tires they were, and at a reasonable price. And hey, they claim to be Europe’s largest producer of agricultural tires, so how could I go wrong? 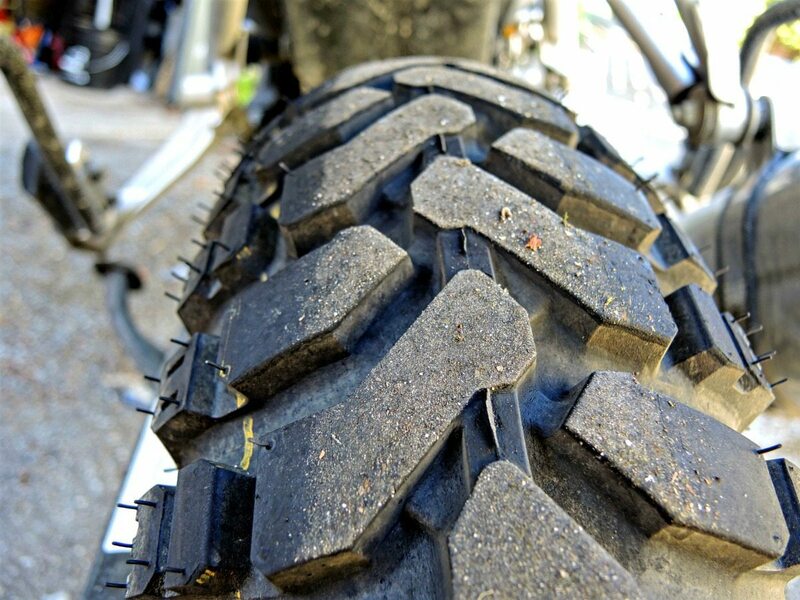 However, turns out they’ve been in the motorcycle tire business for decades, primarily off-road. They have a fairly robust competition history as well. Rather than the centre strip that the K60’s sport, the Mitas relies on a chevron pattern that almost gives you the effect of a centre strip, so you get some benefit on road, but without the downside off-road. A combination of popularity and lean production had resulted in a lack of product on our shores, but Twisted Throttle was able to get me a set within a couple of weeks. Spooned on at ridiculous expense by my dealer (I won’t do that again) I was ready for a new riding experience. After a 200km scrub-in so I didn’t kill myself. Do you like to read the end of the book first? These tires are worth every penny. Now I’ll tell you why, after 2,000kms of testing. At first, they did take a little getting used to. You can slightly feel their knobbiness on pavement, they make a bit of noise (nothing significant above wind and engine sounds), but the bigger issue for me was building my confidence in cornering on pavement. There is a moment when you lean them over that you feel the tire move to the side tread blocks that is a bit unnerving when you’re used to street tires. Once I got used to that, I started pushing harder. And harder. I am quite frankly surprised at how good they are on pavement. No, I did not get a knee down on my very tall bike, but I never have anyway. But I could ride them at a “spirited pace” without worry, whether it was just me on the bike, or loaded with 50 kilos of gear for a week of camping. They are rated for sustained speeds of 190kph. I have not done that. But I have run sustained speeds higher than I should have (don’t tell anyone) and they were fine. I do not endorse, nor suggest, exploring lean angles with a 50-50 tire. I only risk my life for you, dear reader. Suffice to say, they work just fine on pavement for an ADV tire. 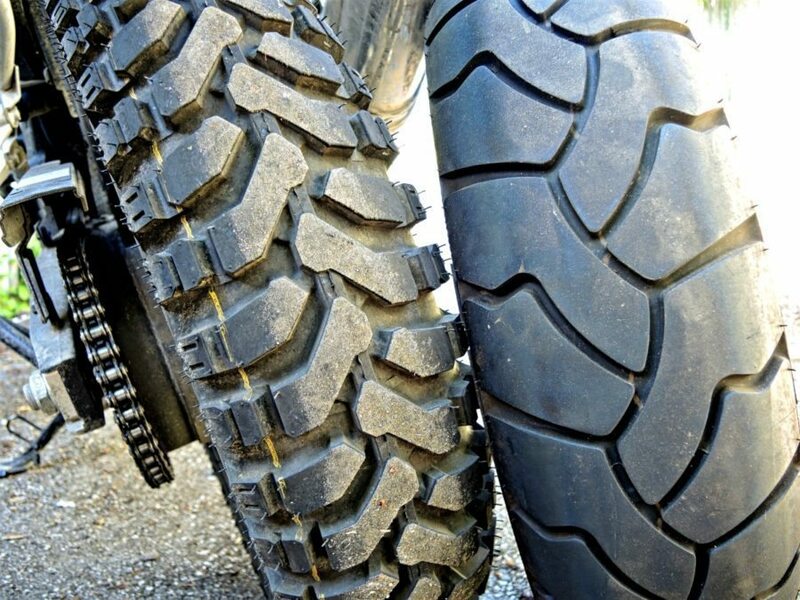 As a dirt tire, they are obviously a huge improvement over my old street-oriented tires. Both ends dig in much more securely and they have significantly improved my off-pavement experience. Having said that, I have not done any mud-bogging or crossing of rivers. Yet. But for forest service roads and the like, they are transformative. How’s that for fancy? So if you’re the kind of rider who does want to get dirty sometimes, but still be able to tour to get to the dirt, I’d say that their few, minor, drawbacks are far outweighed by their positive attributes. Especially for the money. I would not hesitate to recommend them. – Guest review by David G. Williams. David lives in North Vancouver and is an avid wild camper and motorcyclist. 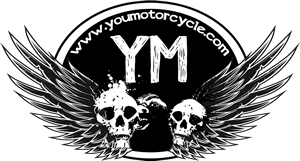 His freelance writing and photography occasionally appear in Motorcycle Mojo magazine. He considers himself handsome, but we’re not convinced. Check him out on Facebook or follow him on Twitter. Thanks for the information and pictures, it’s good to see the comparison between the original tire and the mitas. 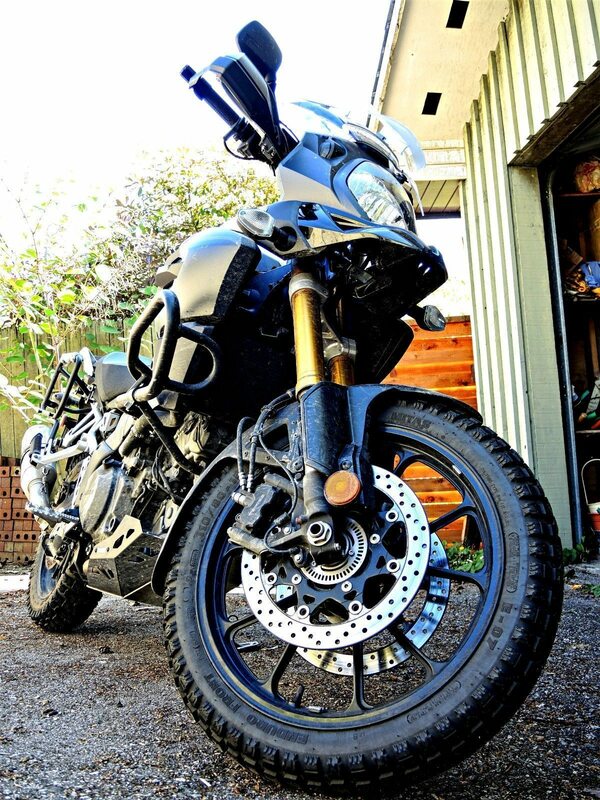 I also have a 2014 V-strom and I am really considering these tires vs. the Michelin Anakee Wild or the Continental TKC 80 of which I previously had on my klr.